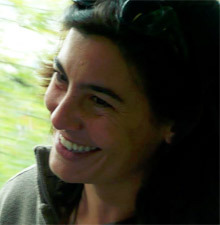 Originally from Spain, Ana Sanz-Magallón has been working as a script consultant and story editor since 1996, participating in the development of more than 30 released feature films, including Bajo las estrellas by Félix Viscarret (2008 Goya award from the Academy of Motion Picture Arts and Sciences of Spain for Best Adapted Screenplay), El truco del manco by Santiago Zannou (2009 Goya award for Best New Director), Tres días con la familia by Mar Coll (2010 Goya award for Best New Director), and Estiu 1993 by Carla Simón (award for Best Debut Film at the 2017 Berlin Film Festival, 2018 Gaudí awards for Best Film, Best Director and Best Screenplay, and 2018 Goya award for Best New Director). Ana has been a facilitator in numerous script development workshops organized by public film institutions in Latin America (Proimágenes in Colombia, the National Autonomous Film Center (CNAC) in Venezuela, the National Film Council (CONACINE) in Peru, the Dominican Republic Film Commission) and by the MEDIA/Creative Europe Program of the European Union in the United Kingdom, Germany, Greece, Finland, Romania, Norway and Spain. She is regularly invited as a lecturer and adviser by academic and film institutions, including the Fribourg International Film Festival, the Berlin International Film Festival—Berlinale, Saudi Creative Week, Fundación Carolina or the School of Filmmaking and Visual Communication of Catalonia (ESCAC), among others. Ana has been a jury member for the awarding of script development grants by the Spanish and Colombian Ministries of Culture. She is the author of “Cuéntalo bien” — Common sense applied to stories, a key reference book for Spanish-speaking screenwriters. She holds a degree in Communications from the University of Navarra, Spain, and specialized in Screenwriting at the University of California-Los Angeles (UCLA).